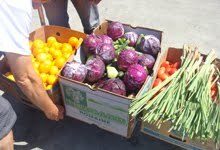 For your personal information, and for everyone picking up and delivering food, here is Food Runners founder Mary Risley's blog from www.tantemarie.com May 2014. How long does food last? The truth is that most food keeps far longer than we think! Here’s what good cooks do—if they don’t grow the food themselves; they shop once – maybe twice – a week for fresh ingredients. Then, they cook during the week with what they have on hand; and save the excess to turn into another dish later in the week. After all, what is Salade Nicoise? Salade Nicoise is not just a tuna salad from the Mediterranean—it is leftover vegetables made into a salad with tuna. Get it? Here’s another truth! Statistics tells us that most home cooks start thinking about what to have dinner around 5 p.m. the same night. 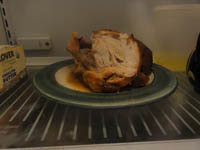 They may stop off at the store, then cook and serve dinner, and then discard the leftovers. Why do leftovers have such a bad name? The reason is because we are afraid if we don’t serve the exact same thing within a day or two, it will go bad. Well, this just isn’t true. Food doesn’t go bad that quickly. Here’s advice from Tante Marie! If it doesn’t smell bad, don’t throw it out! Cooked chicken will keep for a week in the fridge. Cooked seafood keeps for three days, cooked meat for five days. Eggs keep for months in the fridge. Dairy will keep for weeks after the sell-by date. Butter keeps six to nine months in the freezer before it starts to lose flavor. In fact, all foods keep for at least a year in the freezer. 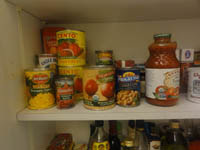 Although it is recommended to recycle canned goods after they have been in your cupboard for a year, they will keep much longer. The same is true of bottled spices; however, but they do lose color and taste after a year. 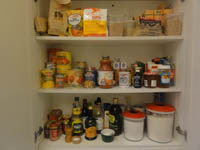 Whole grains and legumes keep a very long time in the cupboard. So, does dried pasta. We live in a world where we read more and more about people sickened by contaminated foods. It’s just the media being alarmist. Of course, people can get very sick from things like poorly processed chicken and mass produced ground beef that is mixed and shipped all over the world. And, the worst is when a cook in a restaurant does not keep his or her hands clean. However, a person who wants to provide good healthy meals for their friends and family should buy responsibly—hopefully from the person who grows the food—cook it well—and plan to make more meals with the excess. Remember, you don't have to throw food out. Why not make a big pot of soup with the aging vegetables in your fridge and add a can of beans, a can of tomatoes and maybe some leftover dried pasta from the cupboard. See my Turkey Chile Video and leave out the turkey. 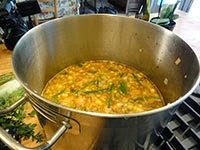 Its pretty easy to make a big pot of soup with what you have on hand and take it to your neighborhood shelter shown on the the map at www.foodrunners.org That way you are helping the planet and people in need.